I was drawing on the past 15 barista competition presentations and countless hours of practice, and even though it was a very new format for me, I felt comfortable sharing my coffee cocktails on that stage. I had a whirlwind three months to prepare myself to present in Brazil for the World Championships in November, but what I didn’t realise is that everything changes on the world stage. The World Coffee in Good Spirits Championships (WCIGS) consists of three different rounds over three days of competition. Here’s how it works. First up, the spirit bar. This takes place in a working bar environment and is designed to test the real-world skills of a competitor. By the roll of a dice you are given one of three pre-selected liquors with which to design and serve a coffee cocktail. On day two, the pressure builds. Once mic’d up and on stage you must present two cocktails of your own design, one hot and one cold, both featuring a specific liquor provided by the sponsor. The top six qualifiers from the first two days make it to the final round where you present your own designer drink as well as your own expression of the classic Irish coffee. The Australian nationals only features this final round, which meant I had only developed one designer drink, one Irish coffee, and one performance. For the WCIGS I needed options for seven drinks and three different performances. To prepare for this challenge, I had the pleasure of working with Martin Hudak, 2017 WCIGS champion and all-round cocktail guru. Using his expertise in the lead-up, we fine-tuned my drinks, workflow, and techniques working towards the polish of a professional bartender. We spent a significant amount of time working on what became my favourite drink, the Irish coffee. For a truly classic drink, I loved discovering how each of the ingredients could work together to make something special. My secret weapon that I couldn’t have gone without came from Riverina Fresh. They helped me develop a custom cream especially for my Irish WCIGS coffee. Once I had all my drinks and performances locked down, it was time to head to Belo Horizonte, Brazil. All up we had nearly 140 kilograms of luggage with bags packed full of cocktails tools, barista gear, bottles of booze, and a Puqpress. Trying to fit all of that into an Uber at the airport was one of the biggest puzzles of the whole trip. The experience of being at the world event was electric. Backstage we had competitors from all over the world competing in Latte Art, Brewers Cup, Cup Tasters, and of course Coffee in Good Spirits. Just speaking to the other competitors was such a great opportunity to learn about other coffee cultures and how they serve coffee in other parts of the world. 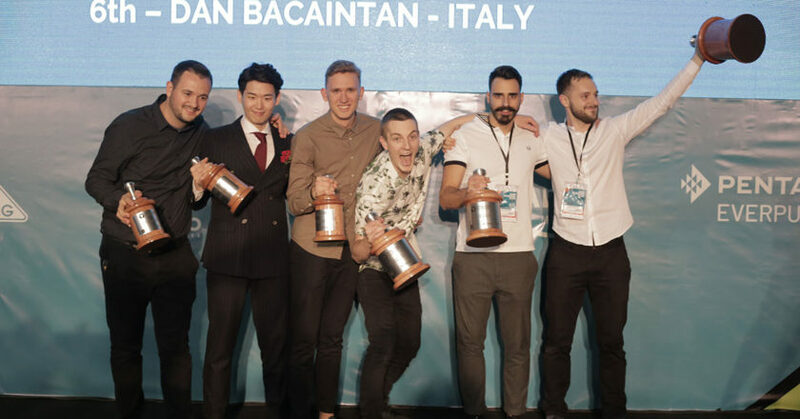 During each day of competition, we saw some amazing performances and so many unique ways of working with coffee in cocktails. I build cocktails the same way I build an espresso blend. Each ingredient serves a purpose and contributes to elements like body, acidity, and sweetness. For the WCIGS, it meant finding the right coffee to pair with the sponsored liquor, and being in Brazil, that spirit was Cachaça. I found that by combining the spicy, boozy flavour of Cachaça alongside fruits like date and baked apple with a natural processed coffee from Ethiopia, I could make delicious drinks such as the Coffee Date, Cachaça Cappuccino, and Espresso Continental. The judges must have liked what I was serving because I was announced as one of the top six finalists. I was so excited. 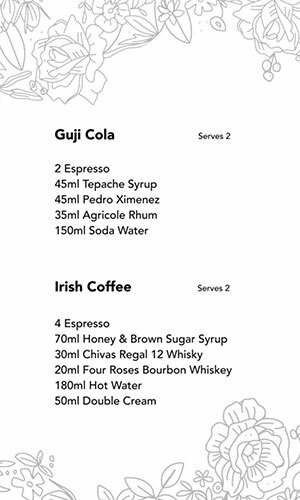 This was my opportunity to share my vision for coffee cocktails on the world stage and on the final day of competition I got to serve my Irish coffee and the Guji Cola, my final designer drink. It was an expression of what I believe coffee cocktails can be, a true representation of coffee flavour. The coffee I used was Ethiopia Jasper 0418 from Project Origin’s CM Selections. I used fermented pineapple to accentuate the tropical acidity of the coffee and a combination of Pedro Ximenez and Rhum Agricol to highlight the coffee’s rich body. My goal with this drink was always to have the coffee remain as the star. Coffee can be such an interesting and complex ingredient for a cocktail, and I’m really happy with how it turned out. Danny Wilson of Ona Coffee is the 2018 ASCA Australian Coffee in Good Spirits Champion.